In the first few weeks of 2019 the topic I’ve heard mentioned more than any other, and one that might be new to you, is the investment principle ‘home bias’. Home bias is well documented as the tendency for investors to over-allocate assets to their home market, ignoring to varying degrees, foreign investments. There are several purported explanations for this but the main one is believed to be behavioural, with the home market offering a sense of familiarity and comfort over unknown companies from far-flung destinations. The professional consensus is that large scale home bias is bad for your portfolio, as single market concentration adds risk and limits opportunity. And in most cases, I agree. However, with much of the recent narrative on this subject coming from a US investors perspective, I’d posit that a controlled dose of UK home bias might not be such a bad idea if you don’t mind looking a little different to the ‘Global Portfolio’. Planning Comes Before Investment Selection. Before expanding on my thoughts, you must understand that home bias is a very specific ‘portfolio building’ consideration, and before even contemplating its effect on your portfolio you will have already identified your financial goals, contemplated risk tolerance, considered tax and put in place a financial plan. All of that takes precedence over portfolio building issues. You should be clear as to why you are investing and ensure that it is suitable, before looking at the detail of how. With that warning made, to fully understand home bias, it’s important to know the size of each country’s investment market so that you can compare your investment allocation decisions. In the chart below, you will see each country’s domestic equity market as a percentage of the total investable world. This is the base ‘Global Portfolio’. i.e. If you bought a representative quantity of stock in every tradable company around the world, you’d end up with your money allocated to each of these countries, in these weights. You can see that the United States is by far the largest market with its stock value representing more than 50% of the global market compared to the United Kingdom’s 6%. That probably makes sense to you when considering the overall number, and total value, of companies such as Apple, Amazon and Google among others. However, the small size of the UK market may have surprised you. So, an investor wishing to invest in the base ‘Global Portfolio’ would allocate their assets on the same country weightings as in the chart and without preference. However, research by Vanguard shows that most investors don’t do that. In fact, for whatever reason, US resident investors on average allocate up to 80% of their stock portfolio to US equities even though the domestic market represents 52%. This is home bias in action, leading to a concentrated stock portfolio with potential added risk. But the rest of the world is no less immune to home bias. UK resident investors nominally allocate nearly four times more of their investment assets to UK equities than the ‘Global Portfolio’ warrants. And this is where I call into question some of the recent opinions emanating from the US on home bias. With the US equity market (represented by the S&P 500 Index) delivering 17% gross average annual returns since the end of the Financial Crisis (March 2009) in comparison to a longer-term average of 10-12%, it’s not surprising that a recent wobble and partial recovery has spooked some US investors into reconsidering their overallocation to US equity. In fact, if the US market does revert to its long-term average then future returns could disappoint in comparison to non-US markets (but I don’t know because I can’t see into the future). 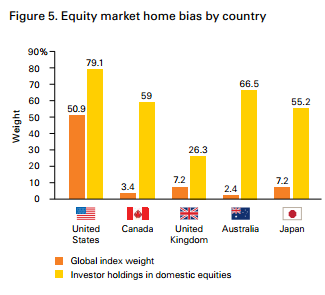 With an average 80% allocation to US equities, the perspective is that home bias could be a problem. From a UK perspective, the ‘Global Portfolio’ means allocating a base 52% of funds to US equities. That doesn’t seem quite so enticing to a UK investor wishing to diversify globally, especially when a recent piece by Meb Faber Research suggests US markets are possibly at their most expensive for 40 years, relative to the rest of the world. Again, I don’t know how true that is and I don’t know how US equities will perform moving forward. But from a UK perspective allocating 52% of funds to what could be a relatively expensive US market is not ideal. Especially considering that periods of outperformance are commonly followed by lower returns. So rather than investing on the Global Portfolio basis with 52% allocated to the US, what effect has a UK home bias had on returns historically? Is a UK home bias a bad idea? And to be clear, we’re not talking about going ‘all in’ on the UK or avoiding the US entirely, merely toning the US allocation down whilst increasing UK exposure. For example, does the average 25% UK home bias materially affect long-term risk and return? Analysing backdated performance data from Morningstar I compared the gross performance of the ‘Global Portfolio’ as representative by the ‘FTSE All World Total Return Index’ versus an annually rebalanced ‘UK Home Bias Portfolio’ as represented by an allocation of 25% to the ‘FTSE All Share TR Index’ and 75% to the ‘FTSE All World (Ex UK) TR Index’ all denominated in GBP. Table: Global Portfolio vs 25% UK Home Bias. This is just one timeframe and others may yield different results but in this 25-year comparison, the performance of the UK home bias portfolio is lower by 0.15% per annum, with the lowest 12-month return 0.20% deeper for the Global Portfolio (between April 2002 and March 2003). So, in this case, a 25% UK home bias had only a marginal impact on long-term returns and risk of loss. However, this includes a period of exceptional US equity returns, which may or may not continue. Should US equity not continue to deliver, will the Global Portfolio begin to lag on account of its 52% allocation to US equity? I don’t know but I’m inclined to prefer a 25% UK home bias for fear of finding out. And remember that the UK’s largest listed companies are inherently global in their revenue streams anyway. Companies like Royal Dutch Shell, HSBC and Vodaphone aren’t confined to the UK. My own opinion (and it’s just an opinion) is that I understand and appreciate the US perspective of home bias. 80% average allocation to their domestic market is just too high. But likewise, for a UK investor, the base 52% allocation to US equity also seems large. There is no rule stating that the US will continue to be the dominant investment market. Whether or not you consider a UK home bias of up to 25% justifiable comes down to you answering two questions. Does a controlled amount of home bias allow you to feel more comfortable about where your money is invested, which in turn allows you to stay invested for the long-term? 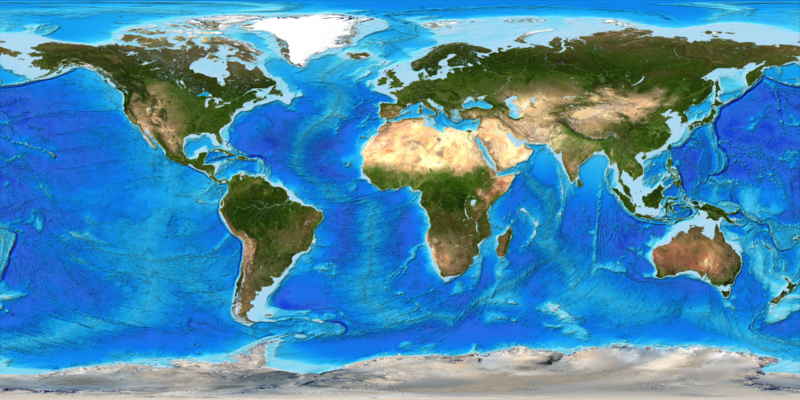 Do you consider a 52% allocation to US equity globally diversified? We’re happy to implement either the ‘Global Portfolio’ or the ‘25% UK Home Bias Portfolio’ on your understanding of the issues, but we default to the 25% home bias in our strategic models.